The District of Columbia says it has corrected problems with the functioning of firefighters' radios in the Metro system. Problems with firefighters' radios became an issue after an electrical malfunction Jan. 12 on Metro, which led to a woman’s death from respiratory failure due to smoke exposure. Firefighters had difficulty using their radios to communicate as they evacuated passengers from a train stuck in a tunnel. 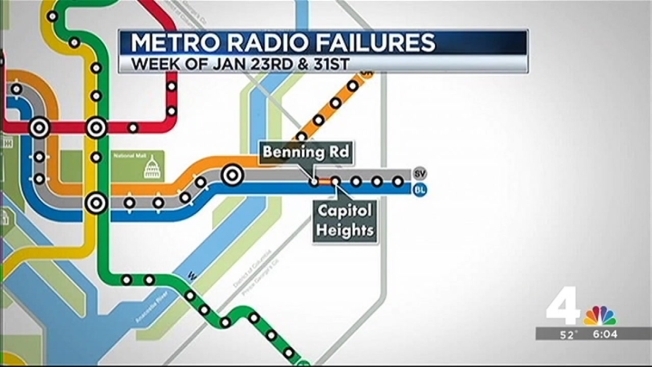 Officials worked on the issues, and follow-up testing finished Jan. 31 found the failure in the tunnel between Benning Road and Capitol Heights again. That has since been corrected, the city said Wednesday. Prior to Jan. 12, the Office of Unified Communications and D.C. Fire and Emergency Management conducted monthly radio testing in the Metro system. Mayor Muriel Bowser asked for increased testing, which is now done on a weekly basis. Radio networks require ongoing testing and tuning to ensure reliability, so we are pleased that the District is conducting frequent, comprehensive testing on the radio systems used by DCFEMS. As noted in their release, the District's most recent testing resulted in only one reported issue, which has been resolved. The District's network includes 34 underground stations, which each are tested in multiple locations, and more than 55 miles of tunnel segments. The District of Columbia has 40 Metro stations within its jurisdiction and tests are conducted at several places at each station including entrances, kiosks, platforms and on trains as they pass through tunnels. One person familiar with the testing told News4's Mark Segraves that it's like playing whack-a-mole: Every time they find and fix one problem, another pops up. Metro and D.C. officials are scheduled to testify Thursday before the D.C. Council about the fatal Jan. 12 incident and radio communications.